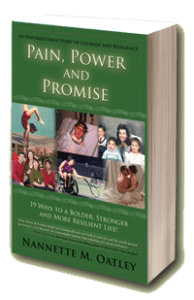 Nannette Oatley Johnson’s book Pain, Power and Promise: 19 Ways to a Bolder, Stronger and More Resilient Life! (2018 edition) is scheduled to be released in January. Like many of our authors, Nannette is a professional speaker. 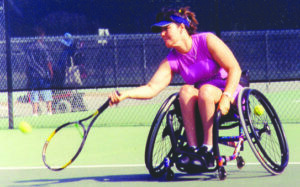 But she also holds Bachelors and Masters degrees in psychology, is a professional counselor, author and holds 12 championship tennis titles. And, she has also won numerous speaking and business awards. Nannette is the mother of three grown children and wife of a retired Arizona Sherrif’s deputy. 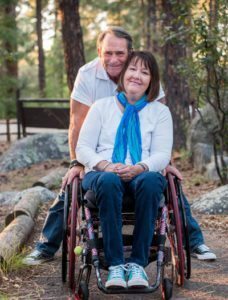 Did I mention that the achievements above came after a snow-tubing accident at age 22 left her paralyzed and a wheelchair user? As Nannette says, she’s a sit-down person in a stand-up world. And please, don’t use the “H” word (handicapped); it doesn’t exist in Nannette’s world except as a pejorative. If it was up to her it would be stricken from the English language. That Nannette’s life after the accident has been so accomplished in spite of being a sit-down person in a stand-up world speaks volumes of the kind of person Nannette is; the kind of person we all can aspire to model more. But please, don’t read this book just because Nannette’s life is an inspiration, read the book because it’s good! It’s irreverent … if you’re a prude. It’s refreshing … if you’re looking for unabashed truth. And it’s hilarious … if you’ve ever appreciated the hilarity in everyday life. Nannette is a treasure. Her book Pain, Power and Promise: 19 Ways to a Bolder, Stronger and More Resilient Life! is a treasure. We are happy and proud to help her share her story with the world. Nannette’s story is unique. Your story is too. Is it time to share your story with the world? If it is, let’s talk. Just contact me via the simple form below and we’ll arrange a manuscript consultation. I’d love to hear about your story, and I’d love to help you share it with the world.